This isn't about a particular food or item from KFC Japan, but rather about a promotional item. I think there are a lot of absolutely adorable mascots in Japan. In fact, I think they have more cute cartoon mascots per capita than any country in the world (likely any civilization in the universe - there's no chance an alien culture has more). 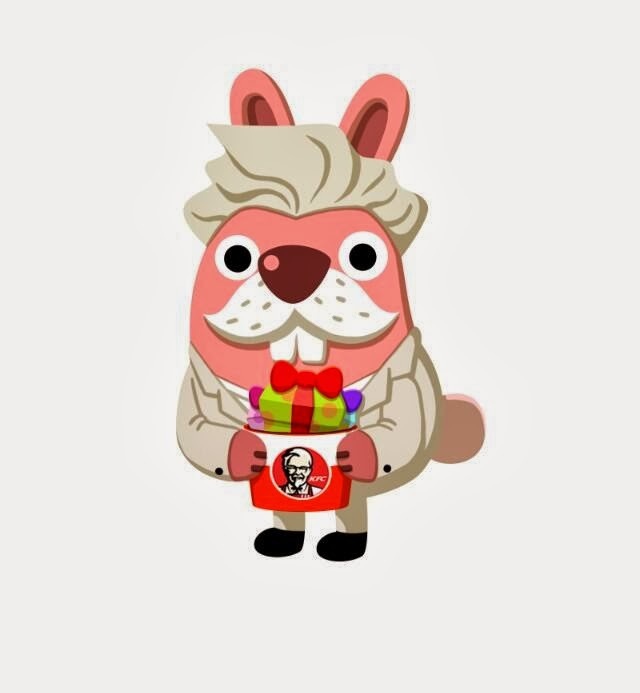 That being said, this thing is a creepy hybird of Colonel Saunders and a bunny. When I look at it, it's hard not to think of some sort of unnatural coupling that produced a result that is horribly wrong. It actually reminds me a bit of the ugly Nova usagi (which I always called the "beak bunny" because of its weird yellow nose) that was extremely popular. I guess rabbits are something that artist struggle to anthropomorphize. At any rate, the point of this post is not to talk about the abomination, but the fact that it is used in a game that KFC is making available for free to promote its greasy poultry products. I have not downloaded the game, but their web site says you can "summon" this monstrosity by tapping on something called "friend's power". I don't know what happens once it arrives in your game, but you might want to have a can of pepper spray on hand. Those who want to give it a go can get it from Apple's app store or Google Play. If you can't understand Japanese, you can enable automatic translation of the pages in your browser (at least you can in Chrome) and bumble your way through in broken English. I agree, that thing is creepy!